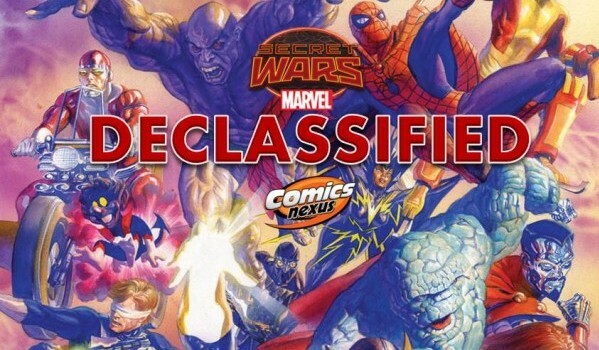 Secret Wars Declassified Week 25: Road Map To Alternate Realities! Fly The Fiendish Skies! Magneto Rex! As the days grow shorter, so does the amount of books released on a weekly basis!! Two more series deliver their last words. Plus, another one-shot unique in its own way. Drop your eyes a bit. There’s something appealing to these Marvel reference books. The first series of OHOTMU ran from 1983-1985 providing extensive encyclopaedic info on the main characters, places, weapons, etc. Marvel revived the concept in 1989, then again from 1990 to 1993. There were a flurry of one-shots specifically focused on the mainstays of the MU like Spider-Man, Avengers, X-Men and so on steadily from 2004 to 2008. Updated versions began trickling in 2010 and stopped in 2012. December 2014 saw AVENGERS NOW! The hottest event of 2015 gets major coverage!! Ten out of ten times infinite universes for thoroughness!!! The truth regarding Clemmie Franklin-Fox finally satisfies my curiosity!! I’m getting ahead of myself. Karl Kaufman is a free man!! So long, suckers! He doesn’t have to be under the feet of the Amazons. There’s a snag in his plans – hesitation. Clemmie comes to him in safari gear and brandishing a pistol. She has deduced his plan, diminished his virility, and divulged his secret plan. She lays her cards on the table: Lord Franklin is her brother, not husband. She became the spouse of an insufferable old fart named Bertie Cox. He was a dolt and did nothing wrong. The obligatory consummation and copulation bored her to death. Luckily for her, he happened to take a nasty fall whilst on a cruise when he got too excited over birdwatching. Clemmie became a wanted woman even though she was completely innocent. She sought Karl and set him up thanks to the only man that warmed her loins: Franko. Long story short, she got the better of the Phantom Eagle. She lets him leave in peace. She still wants to put a bullet in his gut but it’ll be a later time. It seems like Karl is doomed when the raft goes over the waterfall and the plane does not lift off. Fake-out!! He soars the skies once more!! Clemmie thinks she scored the jackpot surrounded by buff and buxom blondes. A nasty storm downs the Bristol F2B Fighter. Karl lands right back where he started. Ish. He’s reunited with the Singaporean princess that he so cold-heartedly discarded. She has been exiled to the Isle of Dung. Together, they will live happily ever after and make beautiful babies together!! Vampish vixen: Clemmie is a wild one!! Magneto begrudgingly works with the hated humans to regain his throne. He storms into the Human Re-Education Centre to set them loose. A throng of Sentinels may end them all until his grandsons Wiccan and Speed save the day with their new friends the Young Avengers!! More opposition comes their way in the form of S.H.I.E.L.D. Magnus has one advantage: he is unrecognizable among his elite Red Guard. Hawkeye gives him some encouraging words. The mission is clear: kick his impetuous son’s behind to the moon. The father incurs his full wrath. Pietro would be quivering in his boots except daddy has been de-powered. No biggie. He has neglected and dismissed his sister for too long. Polaris brings the magnetism. Namor is fed up with the pointless bandying between the royal blood. He takes down the former king and princess. Pietro is such a douche. He kicks his sneered-upon sister. 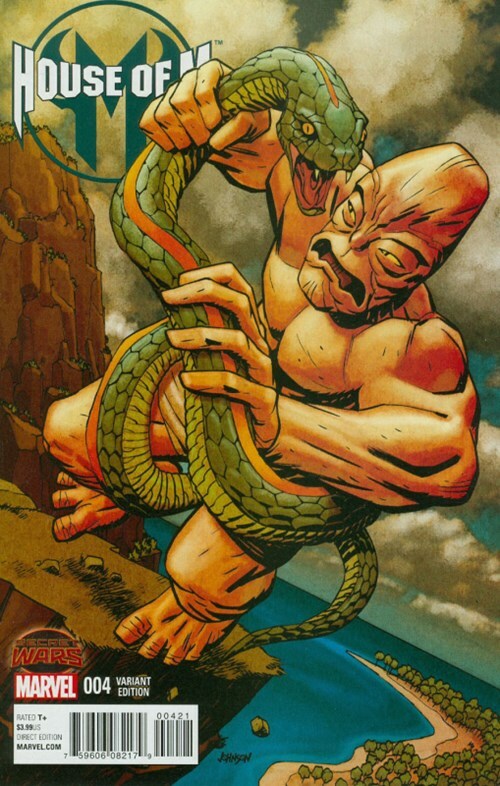 Namor then turns on his ally. The Atlantean monarch deserves the throne not some simpering sycophant. Wiccan and his bro enter the fray after unsuccessfully trying to rouse the Scarlet Witch. Wiccan’s second attempt at re-powering his grandfather works!! He has regained his regal status. 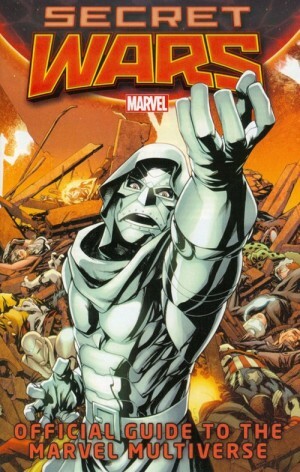 Magneto allows his human allies to keep their freedom. Lorna is able to wipe the smirk off her bratty brother’s face. 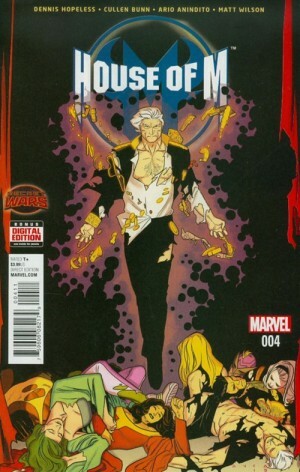 Magnus relishes his position as absolute ruler of the House of M.
Can’t we all get along? “Mutants and humans are natural enemies. No decree from me will ever change that.” – The king has spoken!